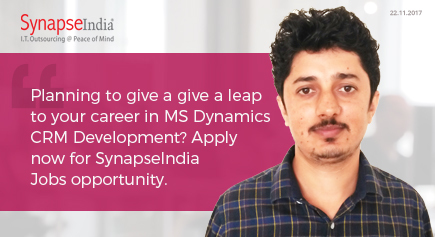 SynapseIndia Jobsfor Sr. Software Engineer (MS Dynamics CRM) profile. The experience required for the job is 3+ years. Applying candidate must have good techno-functional knowledge on CRM 2011 organizations and end to end customization. As a Sr. Software Engineer, you will be responsible to develop customized CRM software. You will also be responsible to deal with clients to collect briefs and ensure all work produced meets their standards. We work on proven execution methodologies to provide you high end and quality services. If you have the right skills and experience, then apply now for SynapseIndia Jobs.